It’s hard to argue against the flavours of fresh, local food. During the growing season, farmer’s markets abound with produce grown right outside your door, and if you’re lucky enough the backyard garden has a few bowlfuls of veggies for you too. That said, it can be tricky to pinpoint new and delicious ways of showcasing the best of each season while it lasts... but farmers like Heather Cameron are getting savvy, leading to cookbooks such as Farm Fresh Recipes From the Missing Goat Farm. This book is dedicated to showing off each season’s prize ingredients in everything from appetizers to desserts, and is certainly one to come back to all year long. Cameron opens the book with a few charming anecdotes of her entry into the farming profession – turning what was a passive dream into an accidental reality. She is the first to admit that the profession was not a natural calling, but in the end the Missing Goat Blueberry Farm turned into a thriving example of home-based agriculture. In each seasonal chapter, Cameron divides the small selection of recipes into breakfasts, snacks, mains, desserts and pantry staples. While the variety of Farm Fresh Recipes is nowhere near that of other cookbooks out there, the quality and quantity of photographs outshines all but the most illustrated coffee-table tomes. Cameron’s writing style in both the recipe descriptions and text is personal and approachable – readers will get the sense that the author is in the kitchen with them, providing gentle guidance and direction with a smattering of humour and encouragement. Trying to pick a recipe out of Farm Fresh Recipes is both simple and incredibly difficult – even though there are only a handful of items on offer, they all appear to be simple, balanced and fresh ideas that would appeal to the whole family. This book does not specifically cater to a particular diet or lifestyle – eggs, dairy, meat, nuts and grains are all used – but the importance of natural, fresh and locally sourced ingredients whenever possible is constantly, if tacitly, enforced. Whether it’s the decadent Chocolate Zucchini Cake (p. 91) or the sublimely nutritious Quinoa, Fruit, and Cottage Cheese (p. 57), having good quality ingredients can make the meal worth trying – but bear in mind that if your family (like my stepfamily, sadly) swears by prepackaged sauces, marinated frozen meats and baked goods from a box mix or the grocery store shelf, the adjustment curve can be a bit steep. While I loved the texture and flavour of Cameron’s Pasta from Scratch (p. 41), my Italian stepdad thought it was “gummy” and “not like ‘real’ (i.e. dried) pasta”. The Chicken Strips (p. 142), which are wholesome panko and almond-crusted chicken breast pieces, were another tough sell to my household, especially since my sister (the major consumer of breaded chicken) knew right away that there was something “weird” about the breaded chunks of meat and refused to eat more than one. Other recipes were a hit with children who already had a relatively broad palate – even if the marketing of the food involved a little name-tweaking. 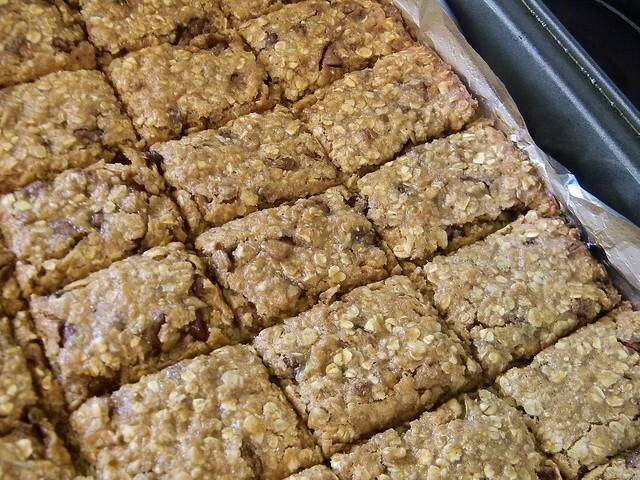 I knew that if I labeled the sweet oat and seed bars as Choc Chip Granola Bars (p. 26) like in the book, I would get nothing but skeptical looks and maybe a few bites from the kids at school – but a simple name change to “oatmeal squares” (keeping the same recipe) led to the whole pan being demolished and the kids licking their lips. I actually wound up making a second batch of the recipe with a banana in place of the egg for allergies, and it was just as delicious and well received. Likewise, Mini Jam Pies (p. 148) became a craved mid morning treat after being re-labeled “pop tarts” – the very type of thing that Farm Fresh Recipes is trying to avoid! 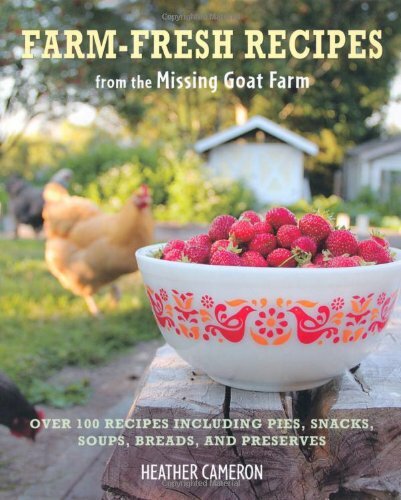 If you’re looking for a wealth of recipes and a “how-to” farming guide, Farm Fresh Recipes From the Missing Goat Farm is not your book. However, Heather Cameron’s combination of personal stories, knowledge, photos and recipes makes her book worth a look for anyone looking to add more fresh, simple, wholesome foods to their family’s diet.